The launch window extended for an hour, and United Launch Alliance (ULA) needed every minute of it. After resolving multiple issues, the Atlas V rocketed into the black on a mission to send the most advanced weather satellite, GOES-R, into geostationary orbit. The first issue that cropped up turned out to be a false-positive indicator on the launch vehicle. Next, however, the Eastern Range also had an issue, which delayed the liftoff time to the very end of the window. Finally, under nearly perfect conditions, the Atlas V with GOES-R lifted off at 6:42 p.m. EST (23:42 GMT) from Space Launch Complex-41 at Cape Canaveral Air Force Station. The workhorse of ULA’s stable of launch vehicles, the Atlas V for this mission was set up in its 541 configuration: 5-meter payload fairing, four supplemental solid rocket boosters, and a single-engined Centaur stage. 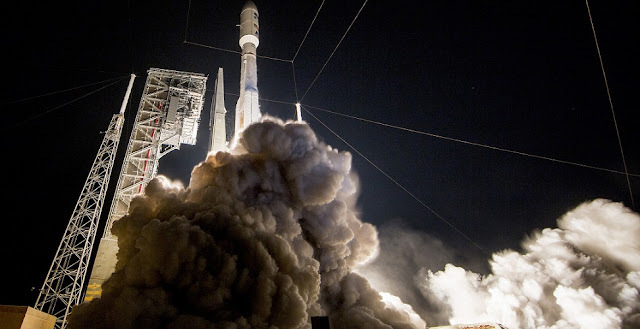 It was the fourth launch of this configuration of the Atlas V, with the most notable payload being the Mars Science Laboratory, otherwise known as Curiosity. It took to the skies in November 2011. The vehicle quickly leapt off the pad after the ignition of the four supplemental solid rocket boosters and rose into the early night sky. Booster separation occurred nearly two minutes after liftoff, with the spent motors tumbling away to ultimately splash down in the Atlantic Ocean. Once above the thick atmosphere, the 5-meter payload fairing was jettisoned approximately three-and-a-half minutes into the flight. Unlike the 4-meter fairing used on the Atlas V 400-series, the 5-meter fairing protects both the payload and Centaur stage from launch and aerodynamic stresses, rather than simply protecting the payload as is the case with its smaller sibling. Indeed, any time four, or more, solid rocket boosters are needed on a flight, a 5-meter fairing is used regardless of the dimensions of the payload. The Russian-built RD-180 main engine continued to power the core stage for nearly another minute, followed shortly by stage separation. The Aerojet Rocketdyne RL10C-1 engine on the Centaur ignited 10 seconds later, firing for more than seven minutes until its first cut-off at 12 minutes, 15 seconds after liftoff. The vehicle then coasted for nearly nine minutes before being re-ignited for a second burn of nearly five-and-half minutes, cutting off more than 27 minutes after liftoff. After a quick succession of events, the booster and spacecraft then entered a quiet three-hour coast before the RL10C-1 was ignited for a third time, this time for approximately 90 seconds. This was followed by the separation of the GOES-R satellite nearly three minutes later. GOES-R represents the fourth generation of weather monitoring satellites operated by NOAA and will eventually be joined by three more of its family, culminating with the projected launch of GOES-U in 2024. Weather forecasters and climate scientists had been eagerly awaiting the launch of GOES-R, which promises to greatly increase the amount of meteorological data that can be collected from orbit. In fact, GOES-R will provide nearly real-time weather data with fidelity and speed unmatched by the current generation of GOES satellites. A key component aboard GOES-R is the Advanced Baseline Imager (ABI). This Earth-facing instrument is able to gather weather imaging from across 16 disparate spectral bands – two in the visible spectrum, four near-infrared, and ten infrared – providing three times more channels of data than the satellites preceding it. The Harris Corporation-designed instrument will account for approximately 90 percent of the science data coming from GOES-R, supplying updated weather data as quickly as every 30 seconds. After a six-month shakedown and validation process, GOES-R will take an active role in enhancing weather and climate forecasting in the Western Hemisphere. Today’s launch was the 67th flight of any Atlas V over its 14-year history. It was the second in only 8 days. Overall, it was the 113th successful launch in a row for the whole Atlas program. Next up for the Atlas V is the Dec. 16 launch of EchoStar 19 at Cape Canaveral’s SLC-41. It will launch in the 431 configuration. Before that, however, ULA is slated to launch a Delta 4 Medium rocket. That flight, which will take the eight Wideband Global SATCOM spacecraft to orbit for the U.S. military, is scheduled to fly Dec. 7.
you will certainly need to enter your existing and also legitimate musicallyloginonline which the username as well as password could be established conveniently. Instead of requesting their personal Google qualifications, frp bypass apk upon what Android OS you are running. Select the Help. Planned for every staff member of usps culture it is likewise liteblue login Likewise, there are the making statements for the prior terms as well as.